I am so behind on blogging, it’s embarrassing. My draft folder is full. But there is something that keeps me from posting here. One and a half months ago I took up learning another language. Right now my head is spinning. I am trying to memorise personal pronouns, tense prefixes and suffixes, and weekdays. Before that I spent three weeks learning to trill the r. Which I was never able to do before, and believe me, I tried. But now, with the help of several Youtube videos (especially this and this one), I can do it most of the time if it’s surrounded by some nice vowels. I also learned to read and write. Yes, that is right. I am learning to read and write all over again. Because I left my European comfort zone by taking up an Arabic class. I was always decent at learning languages – except for Latin, but that was because there’s no one to talk to unless you’re friends with the pope – and I guess that’s why I signed up for this new class without thinking twice. Well, it has been challenging. And slow. We learned to read, we’re practicing to write, and we’re doing tons of grammar. My small talk skills are still very lacking. But I guess I should be more patient. I am getting a general concept of the language and that is very important and useful. It’s something you don’t feel you have at first when everything is written in letters you can’t read. When even the alphabet comes in a completely new order and with several letters you cannot pronounce. And when there’s not a single similarity to any other language you learned before. Because those languages were either related to Latin (Spanish) or Latin and German (English) or German (Norwegian). All of this is very exiting but naturally it steals a lot of time. Time I would normally spent cooking and photographing for this blog. Instead of baking or reading other blogs, I am now watching Arabic Youtube videos. Last Sunday, when I tried to practice for a dictation exercise, I was reminded that there was about a kilo of rhubarb in our kitchen. And I had promised to make a cake. But what cake? My brain was toasted, I had no ideas for any kind of recipe. So I looked at my blog and decided to do a simplified version of a rhubarb pie I posted four years ago (wow!). At that time I felt bad for putting the recipe up. It was a delicious cake but it called for an uncommon ingredient: dandelion honey. Rhubarb is such a simple and humble vegetable, so why add something as fancy to the ingredient list of this pie? I probably was just super exited about my little jar of vegan honey. (To be honest, it’s not really fancy. You can make it at home, it’s made from sugar, water, and dandelion flowers. )Whatever, last Sunday I rewrote the recipe. The tart/pie is now made with the most accessible ingredients you can think of. It’s a simple recipe, with a very tender, sweet crust and a tart filling that calls only for a hint of sugar. But there is a little twist to it. I made another batch of marshmallow fluff for an easy and super sweet and sticky meringue topping. A perfect Sunday treat and some brain food that made learning those letters and prefixes a lot easier. Notes: Refinded coconut oil is very common where I live. If you cannot get it and don’t mind the coconut flavour, use unrefined coconut oil instead. Margarine should work fine, too. To make the marshmallow fluff for this recipe, double the amount of sugar (100 g or 1 cup powdered sugar). You can also omit the fluff and use coconut whipped cream instead, or leave the tart naked. To make the filling, combine rhubarb, sugar, and cornstarch. Let sit for about an hour and stir well from time to time. To make the crust, mix salt, flour, and sugar in a bowl. Add coconut oil and orange zest. Mix with your hands and form into a crumbly dough. Make sure the fat is incorporated well and there are no lumps of coconut oil remaining. Grease a springform pan (26-27 cm or 10 inch) with fat. Press into the bottom and the sides of the pan. (Only line about 2.5 cm or 1 inch of the sides with dough. You just want a small border, so the filling doesn't leak. )Set aside. For the custard, combine soy milk, cornstarch, and sugar in a small saucepan. Whisk until the starch is dissolved and bring to a boil. Cook for 1-2 minutes, or until thickened. While the tart is baking, prepare the marshmallow fluff. Transfer to a piping bag with a star tip right before the cake is done. Pipe dollops on top of the tart, increase the temperature to 200°C (400°F) and bake for another 10 minutes, until the meringue is browned. Let cool completely and remove from pan. Such a beautiful tart, Mihl! I don’t think I’ve ever eaten rhubarb without strawberries, but I think I’d like it. I hope I can get my hands on some rhubarb myself before the season is over. And it’s so cool that you’re learning Arabic. When I was learning German, I would always accidentally sprinkle in Spanish words here and there, so I have enormous respect for anyone who’s learning an entirely new alphabet. 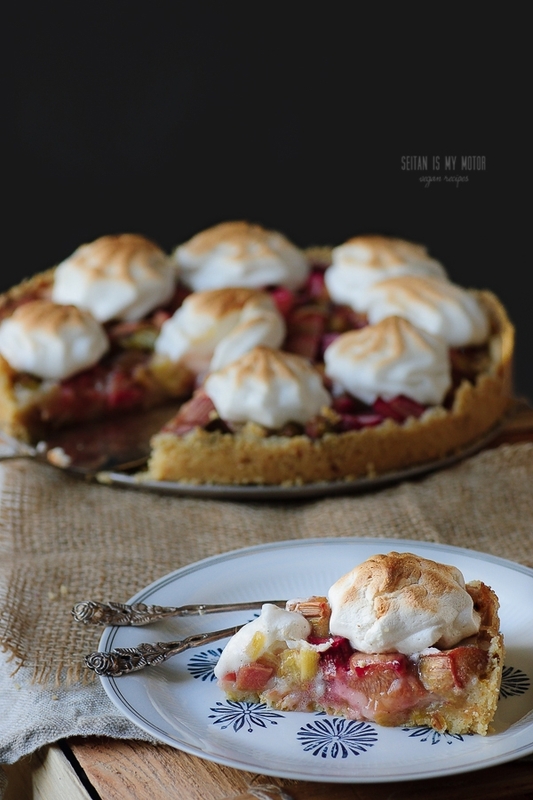 This looks so delicious, I love rhubarb so much! It’s so cool that you’re learning a language and pushing yourself out of your comfort zone with something totally new is such a fun and challenging way to do it. I know! Sometimes the internet is awesome. Mihl, This is one dessert I miss every spring time. I cannot believe it looks like you have recreated it so spectacularly. Ein Rhabarberkuchen muss ich auch noch machen dieses Jahr! Eine neue Sprache mit neuem Schreibsystem zu lernen ist wirklich noch mal etwas anderes. Ich habe ein paar jahrelang Chinesischunterricht genommen aber dann um mein Abitur herum aufgehört weil ich keine Zeit mehr hatte/glaubte zu haben. Das schlimme war dabei nicht das lernen der wörter, sondern dass ich mit den zeichen total hinterher hinkte. Zum Aussprechen hatte mein einer Lehrer übrigens wirklich ein Lehrbuch der 1. Klasse in China, dass da auch nur zum Lernen der Intonationen dient. Das ist wohl das Besondere an der chiesischen Sprache, denn solche Lehrbücher gibt es für Arabisch oder Englisch ja nur als Fachbücher. Ich habe eine englisches Phonetik/Phonologiebuch aus dem Studium und fand es immer unglaublich hilfreich. Looks amazing, great recipe for Mother’s Day. And congrats on tackling a new language. Ahhh your timing is impeccable! My sister-in-law has been bragging about having made a rhubarb custart tart with “real ingredients” as she calls them i.e. eggs and milk and I was feeling a little left out. 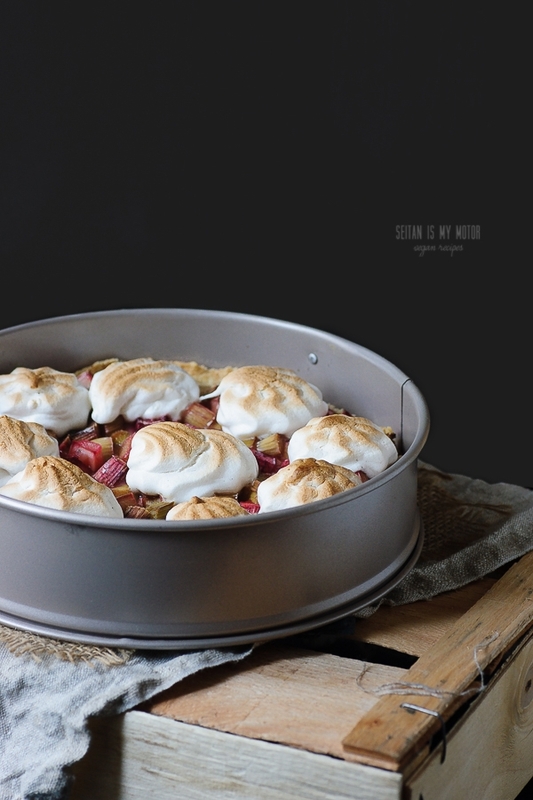 Rhubarb is one of my all time favourite veg-fruit, thank you this recipe is just what I need. ps bet her’s didn’t have meringue on top either!! Real ingredients? All ingredients are real ingredients. I hate it when people do that whole good vs bad thing with food. That’s fantastic that you are learning Arabic. It must be hard to get your head around a different script but also really interesting – foreign languages are such a great way to understand a different culture and reflect on your own. Ha, I wish I was that far! Maybe next year. This looks so beautiful, I just want to gobble it all up! I’ve always been impressed with your baking skills, but am doubly impressed with your language skills. It’s one thing to learn another language that uses the same alphabet as your own, but a completely elevated level of complexity to learn one with a totally different system of writing. Next will you learn Chinese? Good luck with the Arabic class! Years ago I studied Japanese, so I know what you mean about how starting over w/a new writing system makes everything so much slower!! Rhabarberkuchen – schon das Wort versetzt mich in die frühen Sommertage meiner Kindheit. Your recipe sounds and looks absolutely tempting. And if I have to eat the entire Kuchen by myself – I will make in over the weekend, the rhubarb season being at its peak. Arabic – a wonderful idea and challenge. Leaving that linguistic European comfort zone will open up so many more new horizons. Bravo! Danke,Laura! Bei uns gabs in der Kindheit auch immer Rhabarber, den hatte mein Onkel im Garten. Jetzt muss ich ihn “leider” immer kaufen. Bravo, on both this beautiful dessert and on tackling the challenge of a new language. I’m impressed, all round.